In Q1 2012, Forrester Research released their Forrester Wave Email Marketing Vendors report. This report is created to show the email service providers that serve the enterprise market in relation to each other and how they measure up. But, as it turns out, only a few enterprise-level email marketers will truly get the value from this report. The history of the Forrester Wave report dates back to the days of Jupiter Research, which used to publish the “Email Marketing Buyer’s Guide” annual report. Forrester announced the acquisition of New York City-based JupiterResearch in July 2008 and then went on to release “The Forrester Wave: Email Marketing Service Providers” in December 2009. The latest installment is called “Forrester Wave Email Marketing Vendors” – notice the name change – and was released in Q1 2012. The email marketing vendors report can be split into two segments. The first part shows three graphs based on a survey conducted with 74 email marketers, all of whom are customers of the six vendors included in the Email Marketing Forrester Wave report. At the end of 2011 Forrester conducted product evaluations, interviewed 18 email marketers and did an online survey of 74 email marketers to gain client feedback on their vendors and the market. They interviewed six vendor companies: Epsilon, ExactTarget, Experian CheetahMail, Responsys, StrongMail, and Yesmail Interactive. All the interviewed and surveyed email marketers were provided by the vendors themselves. The first part of the report goes into the survey, with questions about the biggest challenges in email marketing, which email tactics are often applied, and what these marketers think is the most important part of the vendor offering. The email vendor report also includes a table with the most-applied email tactics, split up in daily vs. once a month or more. There might be some ambiguity in the interpretation of these questions. What is considered a “welcome email program” and what does “coordination of email with mobile” entail? It does give a nice roundup of what Forrester thinks are the future tactics that an email marketer could consider when selecting an Email Service Provider. 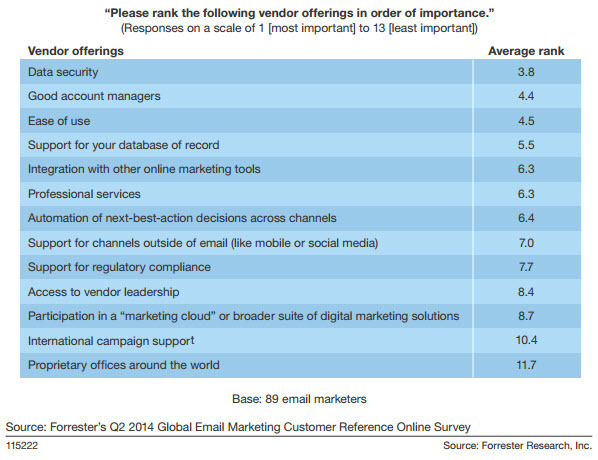 It becomes more interesting when the marketers rank the different vendor offerings by importance. 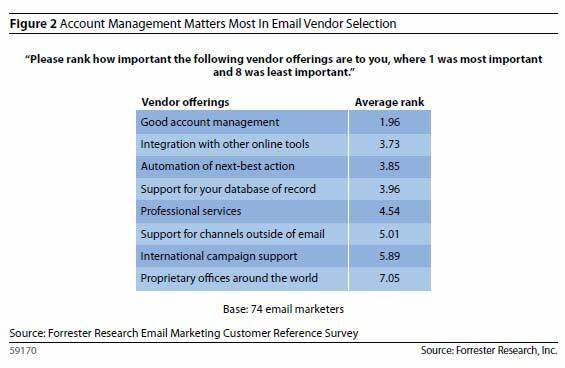 Good account management is at the top of the list for these enterprise email marketers. Second is the integration with other online tools, and third is the automation of next-best action. Proprietary offices around the world is deemed least important, but not all email marketers surveyed work for an international company. The second part of the Forrester report is the actual email marketing vendor wave chart and a table with the wave scores. 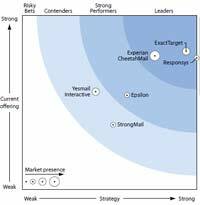 Forrester decided to narrow the number of vendors included in the report and only looked at enterprise-level email marketing vendors. The Forrester wave scores the email marketing vendors based on current offering and strategy, and then plots them in a graph. The final ranking labels the vendors as either “leader,” “strong preformer” or “contender.” You can see the chart by clicking on it on the right. Instead of 15 vendors as in the 2009 edition, only six were included. (We list more than 300 email service providers here.) Two chapters – “The email marketing vendor evaluation explained” and “What changed from our 2009 Forrester wave” – attempt to explain why these six vendors were selected. Does the vendor provide software as a service? Does the vendor have revenues of at least $10 million from email? Does the vendor send volumes of at least 200 million/month? Does the vendor have at least 35 enterprise-level customers? The truth is that some of the criteria in the 2012 report (like percentage of enterprise clients or main focus market) aren’t shared by marketers that are selecting an Email Service Provider. Therefore, the true value of the report will be less for these marketers. Even if they are among the select fortune 1000 companies that Forrester is aiming at, the last selection criteria, “prominence in client conversations,” seems a bit out of place for an industry report. It might be interesting to note that we could not find a dedicated press release by Epsilon Interactive, but Golden Lasso, although just mentioned in one line in the report, did seize the opportunity to inform the world about it. 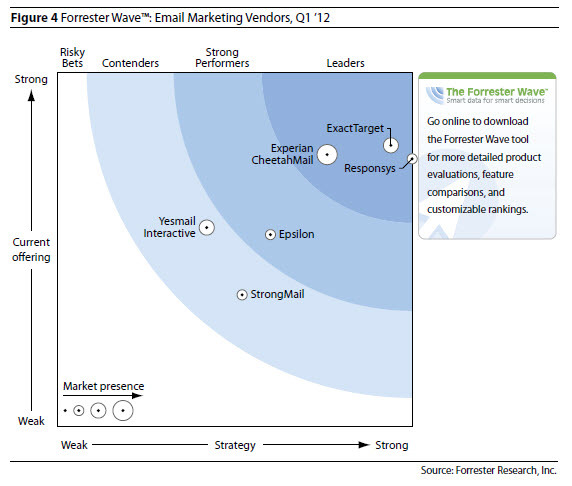 Forrester has made the Forrester Wave Email Marketing Vendors 2012 into a report that is usable (but certainly not complete) for American email marketers looking for an enterprise-level solutions. After a break of two years, the report was highly anticipated. Too bad it does not carry its value over to other segments or countries.